The ripe seed of the perennial woody plants Myristica fragrans Houtt. of family Cardamom. 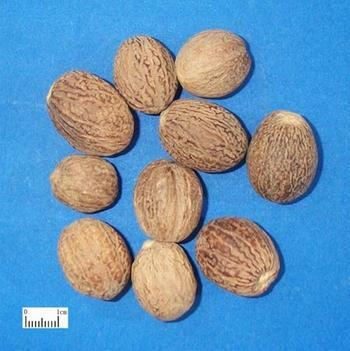 Mainly produced in Malaysia, Indonesia, and also be cultivated in the south of China, too. Take the ripe fruit in spring and autumn; remove the shell, peel, dry it in low temperature. Strongly fragrance, pungent and slightly bitter. Large, firm, and heavy with strongly fragrance after broken. Pungent, warm; spleen, stomach and large intestine meridians entered. Astringe intestines to check diarrhea, warm the middle and promote flow of qi. It is an appropriate herb for diarrhea and dysentery of deficiency cold type, because it is pungent, warm and astringent in property, and it can not only astringe intestines to check diarrhea but also warm the middle and spleen. For chronic diarrhea and dysentery due to deficiency cold in spleen and stomach, it could warm the middle, astringe intestines to check diarrhea through combined with the middle-warming and spleen-tonifying herbs. For instance, it is used with Rou Gui, Gan Jiang, Dang Shen, Bai Zhu and Ying Su Qiao in the formula Zhen Ren Yang Zang Tang from Tai Ping Hui Min He Ji Ju Fang. For kidney and spleen yang deficiency, diarrhea before dawn, it is combined with kidney-spleen-warming and tonifying herbs. For instance, it is used with Bu Gu Zhi, Wu Wei Zi and Wu Zhu Yu in the formula Si Shen Wan from Zheng Zhi Zhun Sheng. It can warm the middle, promote flow of qi, and alleviate pain. For qi stagnation due to cold in stomach, distending pain in stomach and abdomen, vomiting and anorexia, it could be combined with herbs to warm the middle and check adverse rise of qi. Decoct 3~9 g; pill or powder, 0.5~1g. Roast it and remove the oil for astringe intestines to check diarrhea.